You may not have heard of the growing Dutch clothing brand Suit Supply. If that’s the case, let us enlighten you: Suit Supply specialises in on-trend tailored menswear and has been making a name for itself in the industry since 2000. Unfortunately the Dutch label found itself at focal point for all the wrong reasons last week after its Spring 2016 campaign caused a social media outburst. 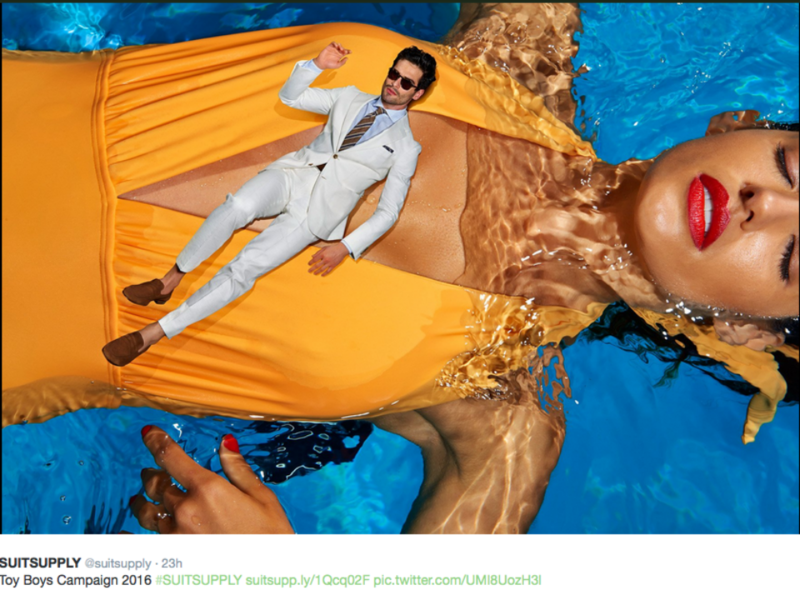 The campaign, dubbed ‘Toy Boys’, launched last Tuesday featuring a look book of images that all vary on the same theme: a suited man posing with a large-scale bikini-clad woman as the backdrop. Although some have praised the campaign’s innovative approach, the majority have said quite the opposite, accusing it of having misogynistic undertones and being deeply backward in its message. Their press release begins ‘sometimes it seems like it’s a woman’s world these days, and we just live in it’…hmmm on average men earn over 20% more and in some countries women still don’t have the right to vote or divorce, but sure, ‘a woman’s world’. Ok, we commend their intention to portray the woman as the dominant and the man as the submissive, but in fact the opposite comes across. The message is pretty flawed and the women look like they are being borderline assaulted with the men touching them in inappropriate places. It wasn’t long after the campaign pictures were revealed that social media exploded, and people took to Twitter to voice their outrage. 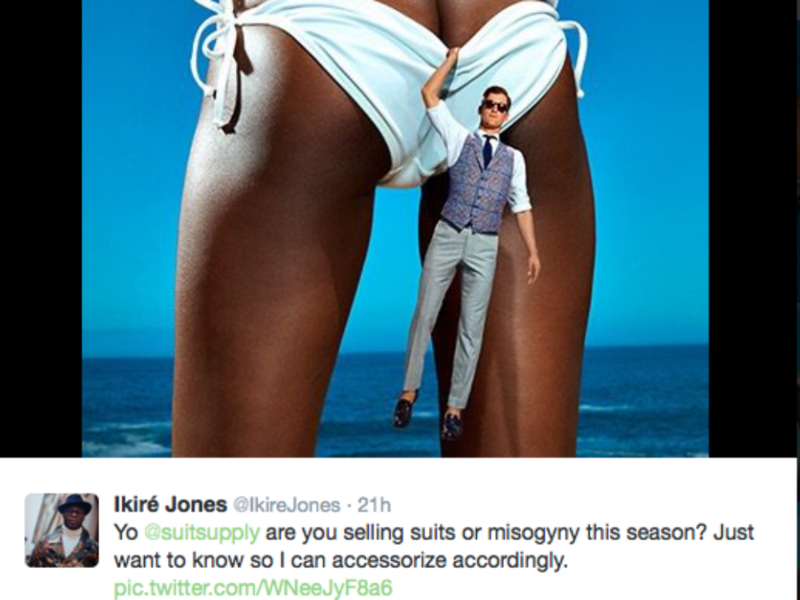 One man tweeted ‘yo @suitsupply are you selling suits or misogyny this season?’ whilst another tweeted ‘wow @suitsupplies, your latest campaign is terrible in so many ways #everydaysexism’. 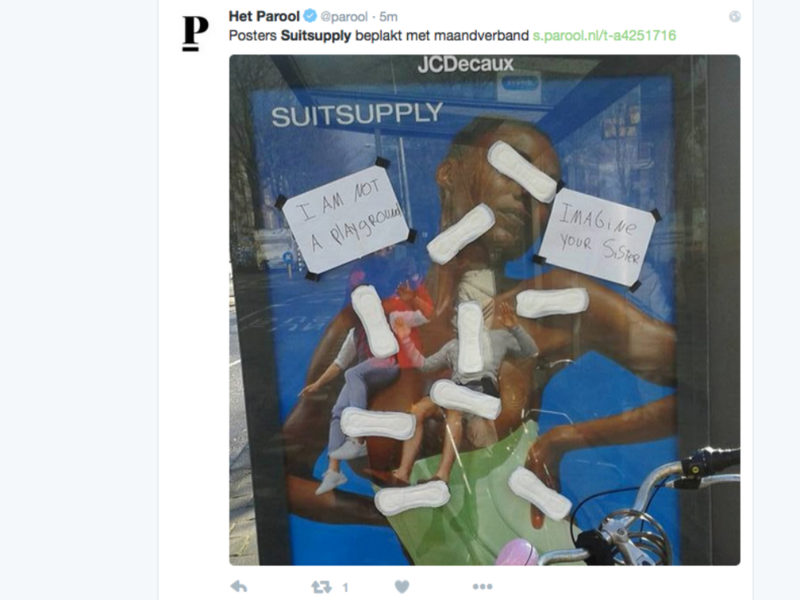 The rage even went beyond social media with angry passers-by shaming its sexist approach, defacing a Suit Supply billboard in Amsterdam by covering it with outraged messages and sanitary towels. We love this. 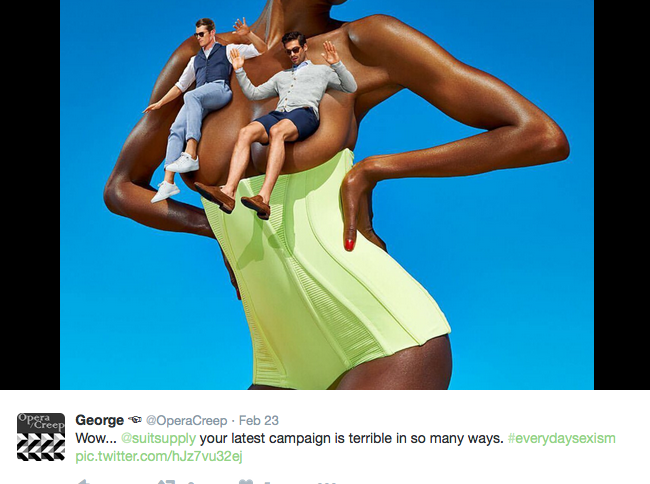 Well, If Suit Supply wanted a highly talked about campaign, that has certainly been achieved, but unfortunately for all the wrong reasons and undoubtedly at the cost of quite a few customers.